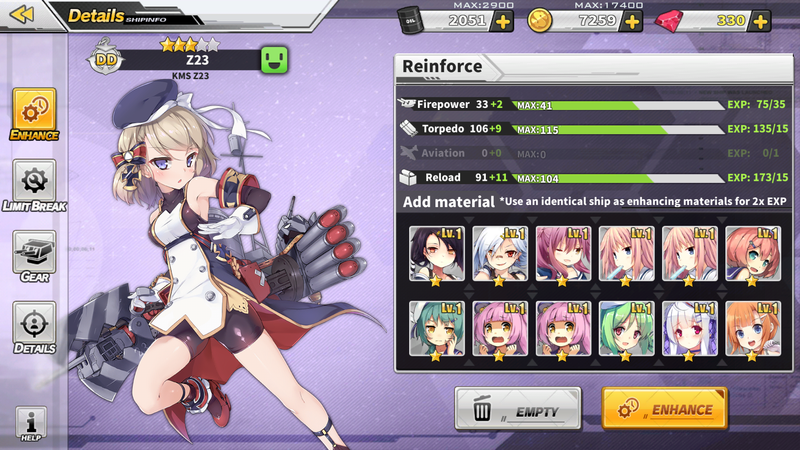 Starting today, you can now download the English open beta of Azur Lane. If you're worried about losing progress, before the final release, worry not, as whatever progress you make will be transferred over. 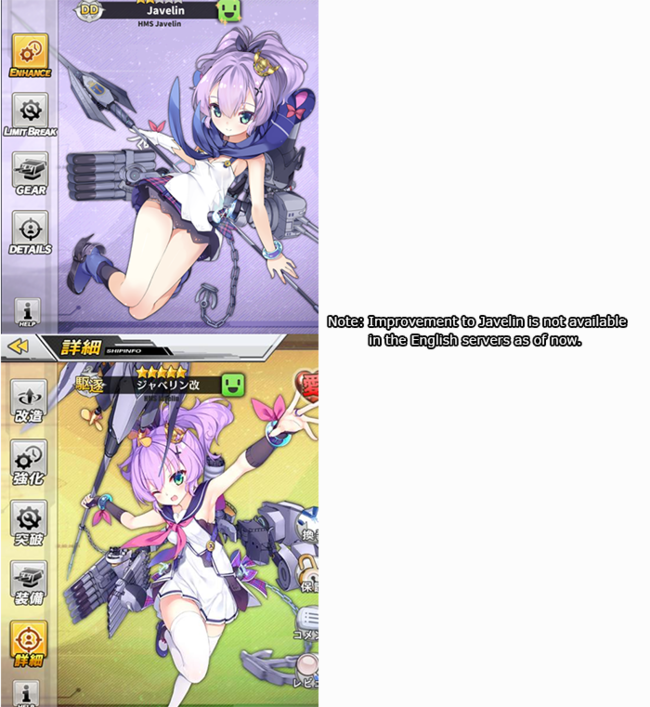 If you're unfamiliar with Azur Lane, it is a mobile shmup mixed with RPG elements. Like all mobile games, they have a steep learning curve but are also simple to play. 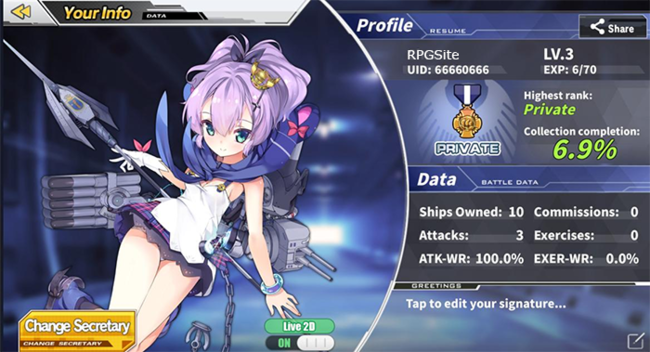 For more information related about Azur Lane, you can also check out their official website using this link. This guide will point out some of the basics you should invest in to maximize your resources and optimize your gameplay. 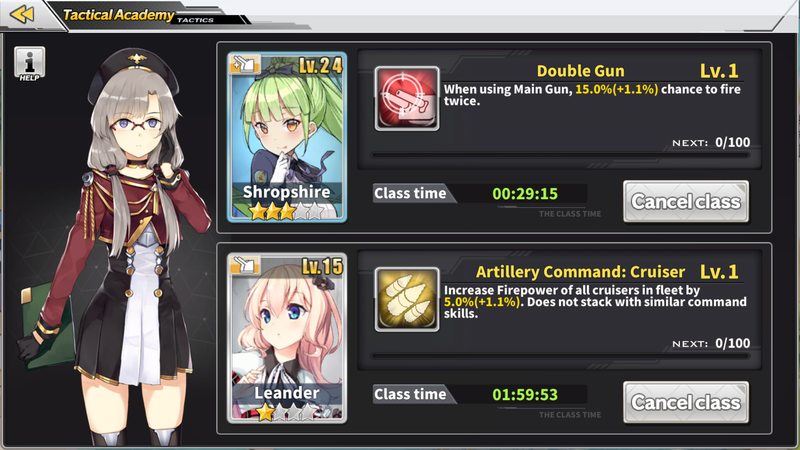 After completing the tutorial, you are given a starter ship (we have a guide to the Starter Ships) - Javelin, Z23 or Laffey. 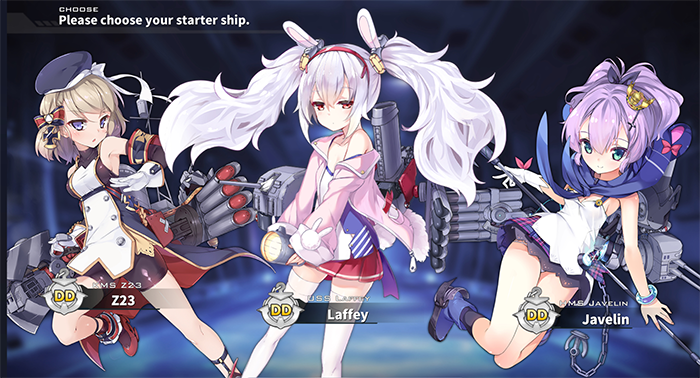 These starters are based on the Chinese version of Azur Lane, so we can probably assume the game is based on the Chinese version's statistics (Japanese and Korean version have different starters, events, required exp and drop rate). 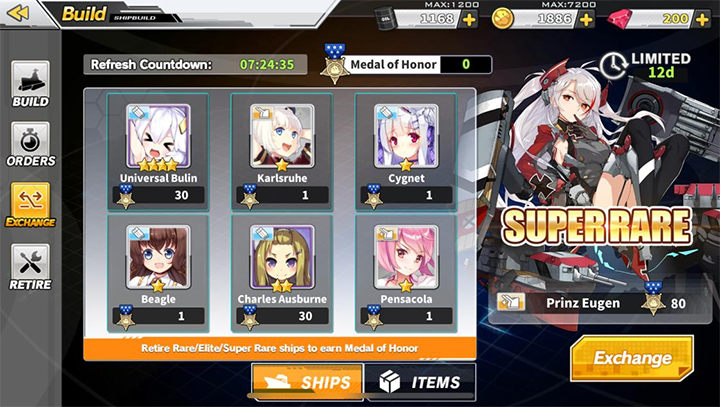 Azur Lane is a very generous mobile game if you do not get a Super Rare unit (The rarest grade so far). Do not despair, there are many ways of obtaining Super Rare units even if luck isn't in your favor. The game offers a pity system, where you can Retire units for medals. This can be used to exchange for Super Rare units. Though the selection of Super Rare unit is limited, you will find as you get further in the game, your issue will be dealing with limited dock space rather than obtaining Super Rare units. Think of the long-term returns rather than the short-term time investment. Rerolling here is also not recommended in general, because the username will not be able to be picked again in the same server. If you do daily & weekly missions while conserving resources, you can eventually get the Super Rare units without having to resort to rerolls or microtransactions. Gems are the paid currency of Azur Lane, you can use this to purchase anything in the game, this range from resources, inventory, costumes, anything. 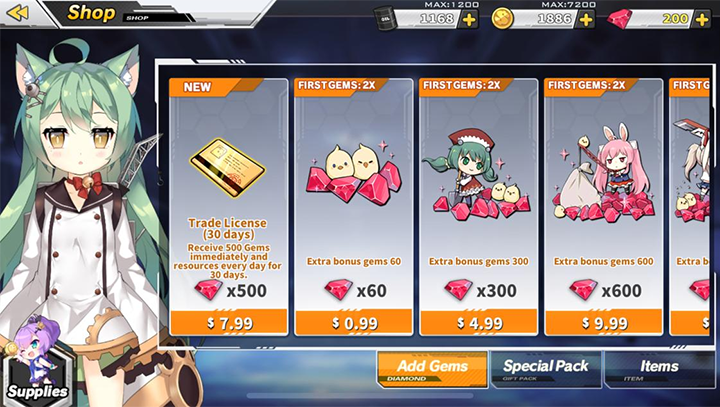 The problem is you will only get limited of Gems without spending money. To maximize your use of Gems, you should never waste gems on resources such as oil, coin or cubes.as these resources are replenished daily. You should save your Gems for things that only Gems can buy. Such as inventory space, dock expansions, and Wedding Rings. Expanding the docks is especially important if you want to collect all the ships. As the game adds more and more new ships, the initial dock capacity of 150 will not be able to contain all of them, so this should be your top priority. After spending plenty of time in the game, you will eventually find yourself dealing with an excessive amount of units. This is from building units each day or getting free units from mission drops. Up to 4 duplicate units can be used as Limit Break materials to further strengthen the unit. Any excess units that you don't use should be discarded properly. For example, the lowest grade units should be used to enhance other units to raise their stats. While rarer grade units should be retired for medals so that you can exchange for better units or Universal Bulin. 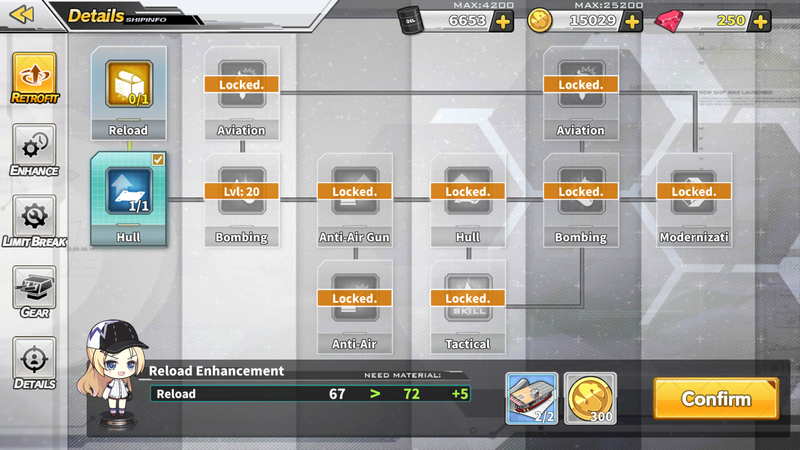 In Azur Lane, there is a wide variety of missions that can be cleared daily and weekly. These missions will reward enough resources to continue playing the game throughout the week. Included in the rewards are Bulins, characters that are mainly used as strengthening materials. These characters can be used to raise the star of other characters, which will increase the cap of their stats. The normal method requires a duplicate unit, while the purple Universal Bulin can act as a substitute to most units from Normal to Elite rarity. The Super Rare units can only be substituted by the golden Prototype Bulin, which can be obtained by clearing 10 weekly missions. Some unit can be retrofitted with blueprints. Units that can be retrofitted will have the Improve option in the status screen. If you managed to fully upgrade all nodes, the unit will rank up and will have a new appearance. Some units when fully upgraded are very powerful. 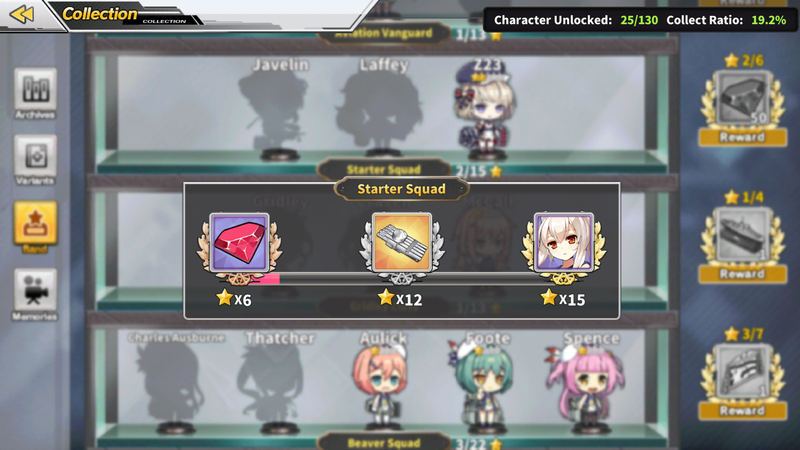 Blueprints are given as event rewards, but they can also drop from clearing missions in Hard mode. Commission projects can also sometimes reward you with Blueprints. Lower grade Blueprints can also be merged into a higher grade. Due to the rarity of Blueprints, you should never waste them on ships you don't use. The Secretary is the character you chose to greet you during the lobby screen. The advantage of the Secretary is that she will automatically receive affection points. When a character has high affection points, her stats will be raised. Normally, it requires you to battle to raise affection, so this is a convenient way of raising affection. You should switch your secretary when she reaches 90 affection, as the game caps at 90 points using this method. Switch to other ships so that you can improve their affections as well. 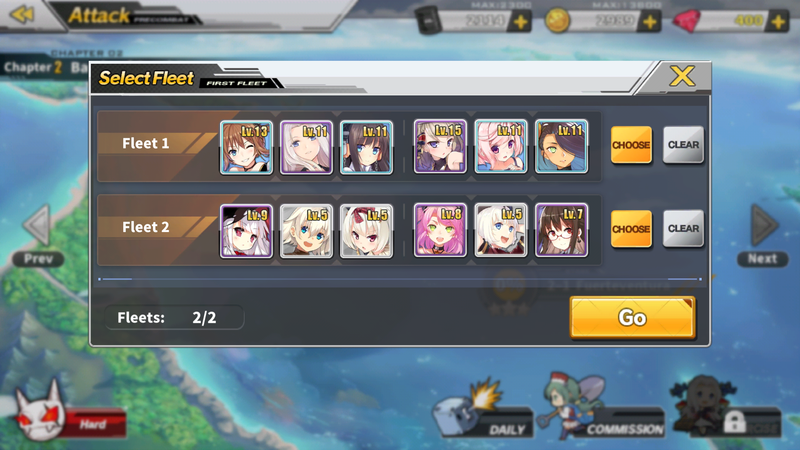 The Dorm in Azur Lane lets some of your ships to rest, you can provide them with food which will automatically give them EXP. This is an easy way of earning EXP for your ships without grinding. Most of the food can be exchanged with Oil, so if you ever reach the Oil cap, you should invest in food so that Canteen can automatically replenish per day. If you haven't unlocked the dorm yet, just simply reach to a Level 8 Commander. The Academy is the location used to learn new skills for your ship and as well as purchase supply boxes for your ship. 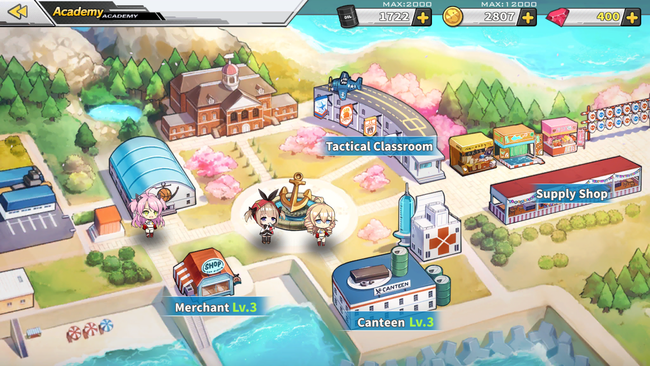 As you reach a higher level commander, you can upgrade the Canteen and the Merchant to increase the speed and cap of daily replenish (Oil and Coin). The shops here also provide rewards for PVP victories and competing missions in Hard Mode. The auto-battle feature will be available after you have cleared stage 1-3. As the title suggests, this will let the CPU take control of your fleet so you don't have to move them by yourself. However, some precautions will still need to be taken when activating this mode. 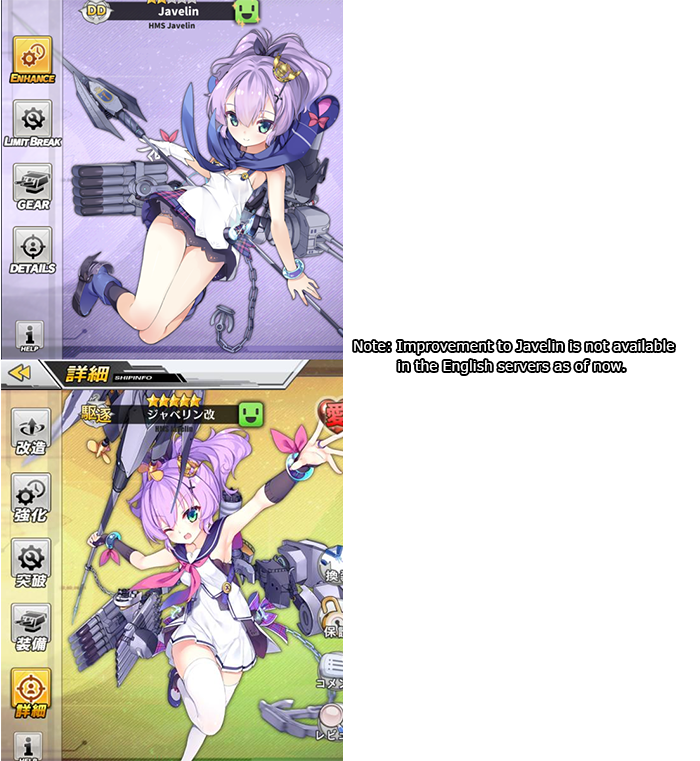 As implied by the warning image, don't expect a smart CPU to control the fleet. It will just randomly move the fleet around the field while barely making any effort to avoid enemy attacks, especially the highly-damaging torpedoes. The CPU will also instantly launch artilleries and airstrikes as soon as the meters have been filled. It does have an advantage for battleships though, as their salvos tend to be more accurate than manual aiming. The higher the level gap between your fleet and enemy ships are, the more damage you will take or the more your bullets will miss their target. 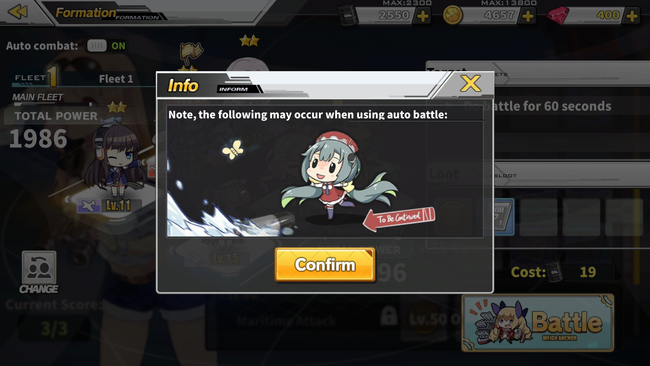 Therefore, it is highly recommended to only activate Auto Battle when farming with a fleet which is considerably stronger than the average level of enemies on the map. After beating Stage 1-4 and heading off to World 2, HMS Amazon will inform that you are now able to form a second fleet. While you can already create the additional fleet beforehand, this also serves as a notice that it will be essential to deploy two fleets instead of one in all subsequent stages. Further stages will spawn more enemy fleets that you have to beat in order for the enemy flagship to show up. Also, keep in mind that a fleet has limited ammunition, so you cannot wage too many battles in a campaign. If a fleet runs out of ammo, all of their attack damage will be halved if you force them to have another battle. 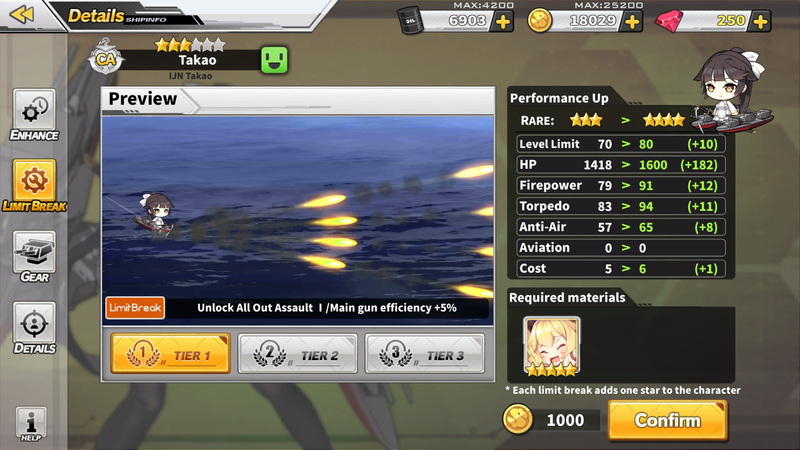 A fleet that has at least 4 stocks of ammo will also benefit from 10% increased damage output. Putting that into consideration, a common strategy during a campaign would be to have a fleet handle most of the lesser enemy fleets, then prepare another souped-up fleet to face the flagship boss.